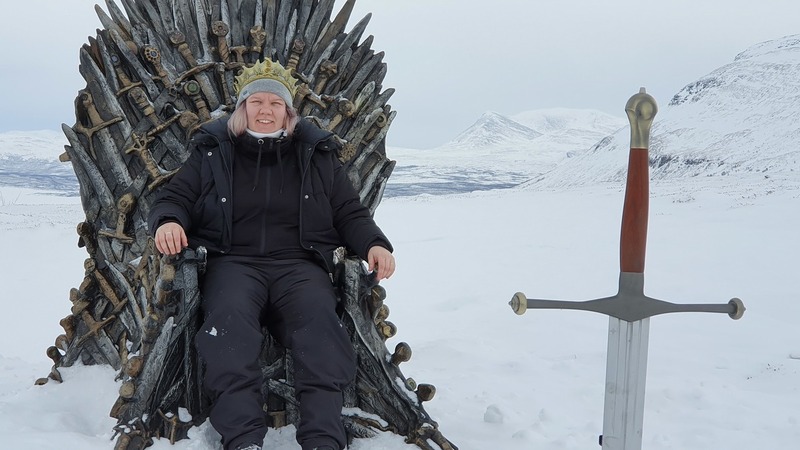 A Game of Thrones Fan Traveled To The Arctic As Part Of A Worldwide Scavenger Hunt HBO created a world-wide scavenger hunt to promote the last season of Game of Thrones. Josefine Wallenå of Sweden drove eight hours in her quest to find the Iron Throne. Josefine Wallenå of Sweden sits on the Iron Throne after driving eight hours to find it. For those who don't watch the show, the ultimate symbol of power in the fictional Game of Thrones kingdom of Westeros is the Iron Throne. So, HBO placed six of them in different locations around the world and tweeted the hashtag #ForTheThrone, along with a cryptic 12 second video. Fans could also view hour-long 360-degree videos of the thrones in various terrains. After looking at one of HBO's tweeted clues closely and its caption, she realized one of the thrones might be nearby. "When I saw the snow , I was like, 'Wait a minute. This may actually be Sweden.' And when I read the first clue, I was sure right away that it was in Sweden," Wallenå says in an interview with NPR's Weekend Edition Sunday. "The clue for it said a crown for each of the three stags." Three crowns are part of the Swedish national emblem and the Sweden men's national ice hockey team is nicknamed "Tre Kronor," meaning three crowns in the Swedish language. Then she combed through an hour-long video posted on the official Game of Thrones YouTube channel and saw the Northern Lights, so she knew to head north. Within an hour from when the clue was tweeted, she grabbed her boyfriend and they drove eight hours in search of the throne — without time to even pack a snack. Their next step was hiking up a mountain in search of the well-known U-shaped valley seen in the YouTube video, called the Lapponian Gate. It was then that they caught a glimpse of the spikes of the throne, hidden more than 150 miles into the Arctic Circle. "It was this super surreal weird feeling, seeing the throne standing there in the snow," Wallenå says. "Like, no no no this is wrong, this is supposed to be in the show, it's not supposed to be in the snow." Waiting for them at the throne was a surprise: a man dressed as a character from the television show. The man, dressed as a member of the famous Night Watch from Game of Thrones, said to the pair, "In the game of thrones you either win or you die, and today you have won." He then put a crown on Wallenå's head, crowning her queen of the North. Besides the throne in Sweden, other thrones have been found in England, Spain, Brazil, Canada, and Queens, New York. In the end, Wallenå got to keep the crown. We pledge fealty. NPR's Audrey Nguyen and Cathy Shaw produced and edited this story for broadcast.